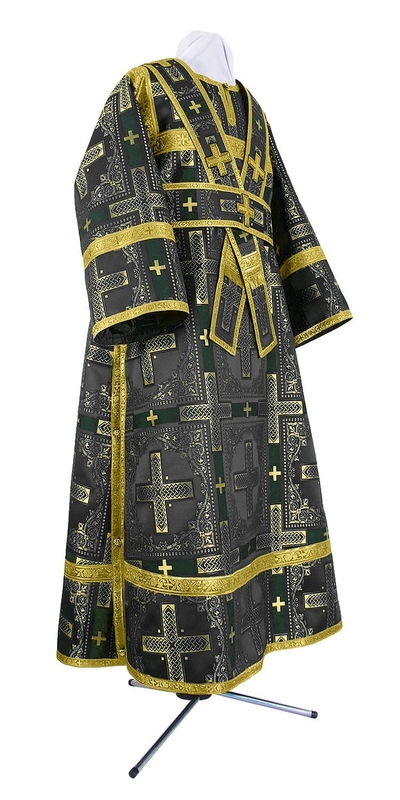 Orthodox Church liturgical Subdeacon clergy vestments (black-gold) by Istok Church Supplies Corp.
Are you in need of authentic and high quality sub deacon vestments? The Orthodox Christian church has strict guidelines and traditions for liturgical vestments which are an intrinsic part of liturgical worship. Istok Church Supplies carries an authoritative collection of genuine sub deacon vestments (Black-Gold) that will make your communion with the Kingdom of God even more spiritual. We use only the best quality ecclesiastical fabrics such as rayon brocade and metallic brocade for our sub deacon vestments (Black-Gold). Our vestments feature myriad traditional patterns that look grand and serve their purpose for many years. Customers who would like their vestment in a different fabric than the one featured can choose from the Fabrics section and request their preference in the Notes field of their order. We try our best to accommodate your request as long as the fabric belongs to the same class as the one featured for a particular listing. 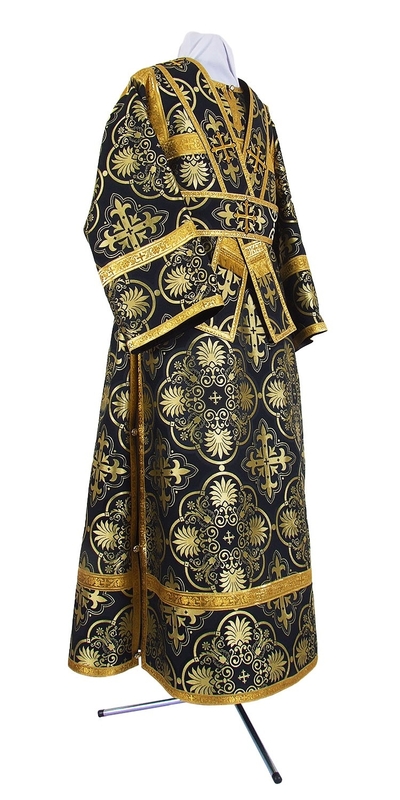 Our sub deacon vestments (Black-Gold) include two clothing articles – the sticharion and the orarion. Wearing these two liturgical apparel items, a sub deacon can assist a Bishop during hierarchical services and lead the serving team during important church services. All our sub deacon vestments are lined with 100% natural rayon to ensure durability and comfort. For a superior finish, we offer three different types of decoration – economy, standard and premier so customers can choose as per their requirements, tastes and budgets. Our black and gold sub deacon vestments are a majestic sight to behold. To ensure perfect fitting, we offer made to measure services. To commission a custom order, customers can send in their exact measurements as per our online Measurement Chart and our skilled tailors in Europe will take care of the rest. Since each order is custom made, we require a few short weeks for execution but we are confident you will be satisfied with the final results. Go ahead and explore our collection of fabulous sub deacon vestments!